It’s conviction that certainly comes across through the high pitches and high level of fervor. I have more sympathetic ears because I hear exquisite control and playing that is as sensitive as it can be. Many notes that would scream out have to be subdued with alternate fingerings to allow them to speak softly, and many such moments indicate this judicious approach that only people who have tried the instrument might fully appreciate. 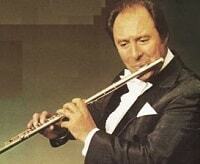 The piccolo is so high that any attempt to turn it into something it’s not will fail. Provided you can accept the instrument as it is, there is much music to be made on it outside its ensemble context in bands and orchestras. The stature of the piccolo has been raised this way only recently. The National Flute Association has been recognizing piccolo players with Lifetime Achievement Awards since 1993, first to Lois Schaefer of the Boston Symphony. 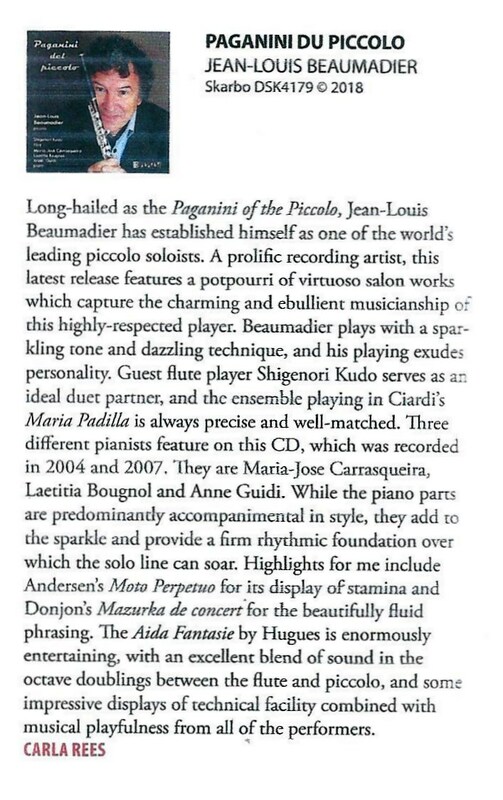 Jean-Louis Beaumadier has devoted his career to exposing audiences to the musicality of the piccolo, largely through playing flute music without further changes, as here. The numbers shared with flutist Shigenori Kudo really indicate the musicality of the piccolo playing. Although the booklet notes could have told us more about the pieces, the information is easily available through online resources such as IMSLP. The assortment of European and South American selections makes for historical and geographical as well as musical interest. © 2018 American Record Guide.